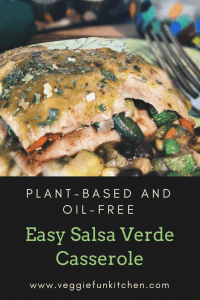 This Salsa Verde Mexican Casserole is vegan and easy to make. 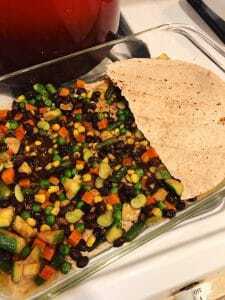 It is full of fresh vegetables, is dairy free, and does not use added oils (except what you will find in the tortillas and if you choose to add vegan butter to the potatoes. 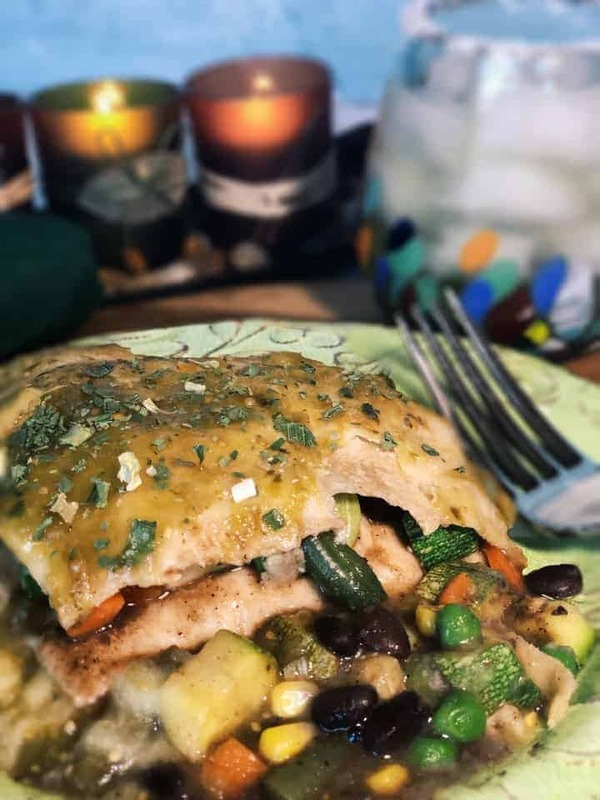 It is super easy to throw together because you use frozen mixed vegetables, jarred salsa verde, boxed mashed potatoes, and canned beans. The only vegetable you will have to cut is your zucchini of choice (I used Mexican Gray Squash). *Affiliate links – This post will contain Amazon affiliate links. If you scroll through you will see products I used that you can purchase on amazon.com. 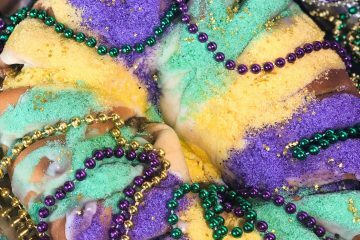 If you click on and purchase through one of these links, Veggie Fun Kitchen might receive compensation at no extra cost to you. Start by cutting the zucchini into small bite-sized pieces. My favorite type of zucchini is the Mexican Gray squash. I like the flavor and the texture when it cooks up. Give it a try if you haven’t! Cut your pieces about the size of a dice or smaller. Line the sauté pan with enough vegetable broth to cover the bottom. We don’t need to cook with added oils! Just watch your pan so that it doesn’t dry up and begin to stick. Add a little more broth if necessary. Sauté for about 3 minutes or until the zucchini begins to soften. Add in the mixed frozen vegetables, and chili beans. Do not drain the chili beans. 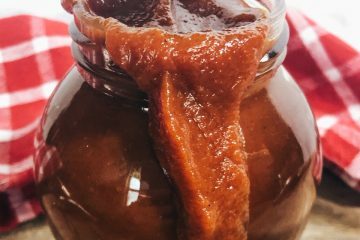 You will want that yummy flavored chili sauce! Make sure to use the chili beans/black beans and do not drain. Add in the onion powder and garlic powder. Continue sautéing for a few more minutes or until the vegetables are softened and the flavors have mixed. Set aside. Now start working on the mashed potatoes. Did you think you would be using mashed potatoes in a Salsa Verde Mexican Casserole? 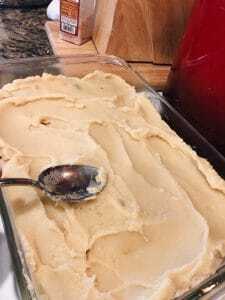 We use the mashed potatoes along with a “secret ingredient” to give a cheesy flavor to this vegan dish – without having to use the fake oily vegan cheese! You can use real potatoes if you prefer. 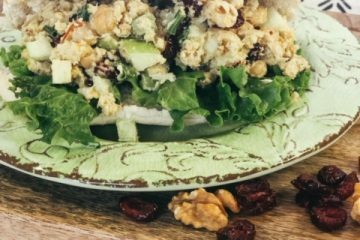 But we don’t always have time for that and because this recipe is categorized as Quick and Easy, we used the dehydrated potato flakes. Mix your mashed potatoes using the directions for four servings. For reference, four servings is 1 1/3 cup potato flakes each. 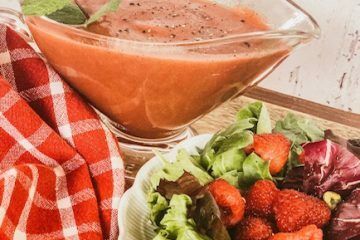 Follow the cooking directions on the package BUT do use vegetable broth instead of water and unsweetened plant milk rather than dairy milk. 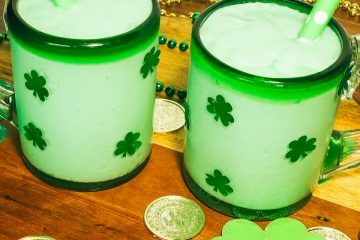 I did not add in the salt because the recipe is plenty salty as is – but do adjust for your taste preference. 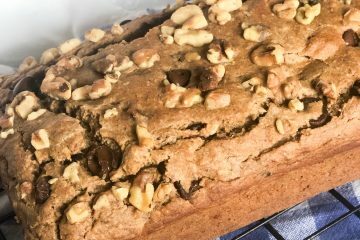 You can choose to add the vegan butter or not. I have not found any vegan butter that is oil-free. If you feel you need it for taste, just be aware that you are adding in oil. I use Earth Balance Buttery Spread – but use what you typically use. And now for the secret ingredient: Nutritional Yeast! 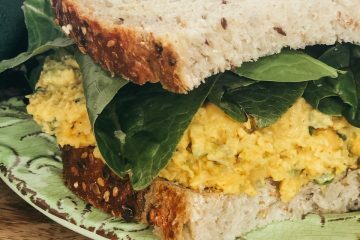 Nutritional yeast is NOT the same as brewer’s or baker’s yeast so DO NOT substitute either of those. 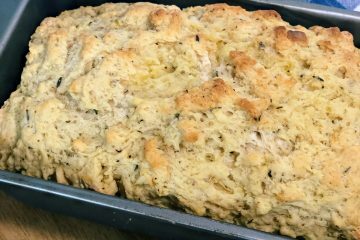 It adds a cheesy tang to your recipe and is really a staple in a plant-based kitchen. In fact, we plant eaters have a nickname for it – NOOTCH! It can be a little challenging to find. At the grocery store, I have found it in the “health food” or gluten-free section. I’ve also found it with the grains…so no real consistency. I usually just buy mine from Amazon. It’s cool because I can just ask Alexa to order me some more and she does it lol! Now for the fun part – layering and putting it all together. This is really more like a lasagna – you need to layer in a particular order for best results. Just follow along with me and it will be perfect! The directions will be numbered in the printable recipe. I use mild salsa. If you prefer more spice, you can use a medium or hot. 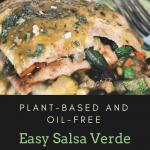 In a 9×13″ casserole dish, spoon about third a jar of salsa verde on the bottom of the pan for the first layer. Spread it evenly. Next, lay two tortillas on top – breaking apart to cover the salsa layer. You will be using about nine 10″ tortillas in the recipe. 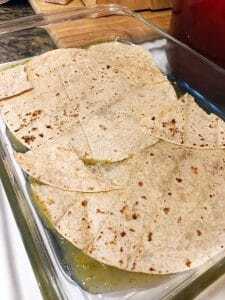 Tear the tortillas to form and fully cover a single layer. Then layer in one half the vegetable mixture. Top again with two more tortillas – again, breaking apart for full coverage. Layer in order according to directions. Now you carefully drop spoonfuls of the mashed potato mixture on the top of the tortilla layer and press/spread until the tortillas are evenly covered. This is the middle layer and so you are half-way done! Cover the potato with 1/3 jar of salsa, spreading evening, covering with another layer of tortillas, followed by the rest of the vegetables. Finally, you cover the second vegetable layer with tortillas and top with the remaining salsa. Cover and bake in a 350° oven for 30 minutes. I let sit for about 10 minutes before cutting into it. This recipe for Salsa Verde Mexican Casserole makes six generous servings. You can top with cilantro or some avocado if desired. 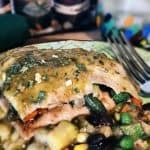 This recipe works great for meal prep. Just portion out into six meal prep containers. 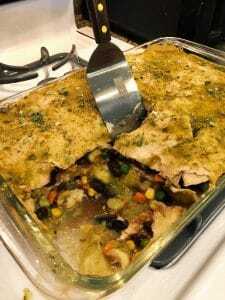 This Salsa Verde Mexican Casserole is meat and dairy free. 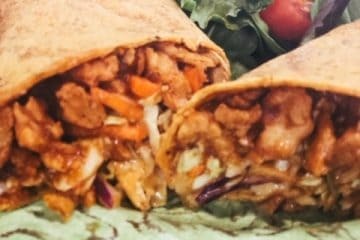 It is full of vegetables and flavor. 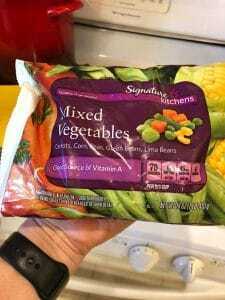 It is easy to through together because you use frozen vegetables, jarred salsa and canned beans. 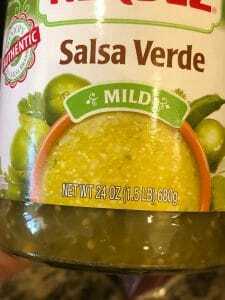 20 ounces salsa verde I used mild. 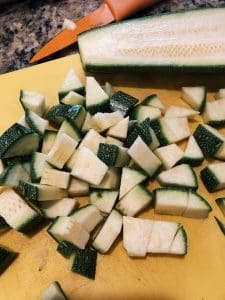 Chop zucchini/Mexican Gray Squash into bite-sized pieces. Set aside. Add enough vegetable broth to line the bottom of sauté pan. Sauté zucchini for about 3 minutes or until it begins to soften. Watch the bottom of your pan so that the broth does not dry out or pan begin to stick. Add more broth if necessary. 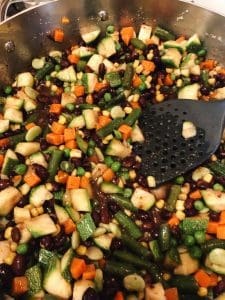 Add the frozen mixed vegetables, black chili beans, onion and garlic powders. 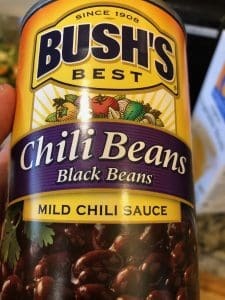 Do not drain the chili bean liquid/sauce from the can, but add it to the mixture. Continue sautéing a few more minutes or until vegetables have softened and the flavors have mixed well. Set aside. 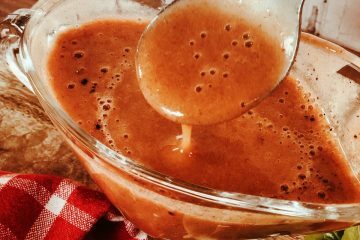 In a sauce pan, bring vegetable broth, vegan butter (if using) and plant milk to a gentle boil. Remove from heat. Stir in dehydrated potato flakes and nutritional yeast. Add salt if desired. Cover and bake at 350° for 30 minutes. Let sit for about 10 minutes before serving.